City-state offers help as storm continues to wreak destruction. On Wednesday, Singapore announced that it would deploy up to four helicopters to assist the United States with relief operations in the wake of Hurricane Harvey. The move is an acknowledgement of both the relationship between the two countries as well as the city-state’s presence in the United States. As I have noted before, both Singapore and the United States have long viewed each other as vital partners, including in the defense realm (“Strengthening the U.S.-Singapore Strategic Partnership”). For Singapore, the United States, apart from being a key supplier of defense technology and facilities for military training, has also been the provider of regional stability that has allowed the city-state to emerge as one of the world’s most advanced economies. For Washington, Singapore has played an outsized role as a security partner, not just across issues like counterterrorism and cybersecurity, but also in hosting a U.S. Navy logistics command unit that coordinates regional operations. Bilateral ties have continued to grow under the U.S. President Donald Trump, despite the city-state’s anxieties over some policies undertaken so far such as the withdrawal from the Trans-Pacific Partnership (TPP) which it had helped shape (See: “The Ticking Clock on Trump’s Asia Strategy”). Singapore Prime Minister Lee Hsien Loong is expected to visit the United States, and Trump will also get an opportunity to visit the city-state next year if he attends the next round of ASEAN summitry which it will be hosting. This week, Lee told Trump as he was en route to Texas that Singapore would deploy four Republic of Singapore Air Force (RSAF) CH-47 Chinook helicopters to assist with U.S. relief operations in the wake of Hurricane Harvey. The storm, the first major hurricane to make landfall in the United States in over a decade, has caused catastrophic flooding in Texas, with at least 30 confirmed and suspected flood-related deaths so far and hundreds of thousands of people under evacuation orders. Lee said the move was a gesture to express appreciation and gratitude to the United States and the state of Texas that has been hosting Singapore’s Peace Prairie Detachment. The RSAF has five training detachments in the United States – the Peace Prairie CH-47 Chinook helicopter detachment in Grand Prairie in Texas; the Peace Guardian KC-135 jet tanker detachment at McConnell Air Force Base in Kansas; the Peace Vanguard AH-64 Apache helicopter detachment at Marana in Arizona; and the Peace Carvin II and III F-16 fighter detachments at Luke Air Force Base in Arizona and Cannon Air Force Base in New Mexico respectively. Last year, Singapore and Texas celebrated 20 years of the Peace Prairie partnership. 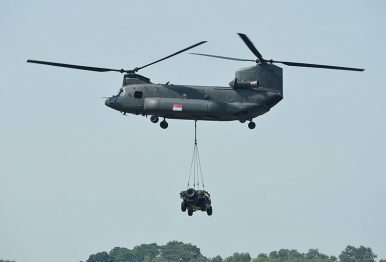 RSAF’s helicopters, whose work is expected to begin today, will be able to both airlift troops and evacuees as well as transport supplies to where they are needed the most, Singapore’s defense ministry (MINDEF) said in a statement. The Peace Prairie detachment provided similar assistance following Hurricane Katrina in 2005. The interaction placed the focus on the broader bilateral relationship. US Pacific Air Force Commander Makes First Singapore VisitArmy Exercise Puts US-Singapore Defense Relations Into FocusWhat Did Singapore’s Latest US Military Helicopter Deployment Achieve?US Air Force Exercise Kicks Off with Singapore’s ParticipationWhat’s in the New US-Singapore Maritime Exercise in Guam?